The Emperor has been playing a long game—one that persists beyond even death. A cackle in the dark. That was all it took for Star Wars: The Rise of Skywalker to deliver its biggest shock—a shock that not even a title, a Death Star, or a host of other reveals in its first trailer could compare to. Sheev Palpatine, Darth Sidious, Emperor Palpatine, call him what you want: He’s back. And it’s a moment that’s been planned for. The resurrection of Emperor Palpatine after his trip down a reactor shaft—a shaft that was then promptly blown to bits—in Return of the Jedi might, at first, seem to come out of nowhere. On the surface, it might even seem like Star Wars is returning to its easiest impulses, the cyclical rhyming poetry in which the present constantly echoes the past that came before, a nostalgia the franchise forever struggles to move on from. 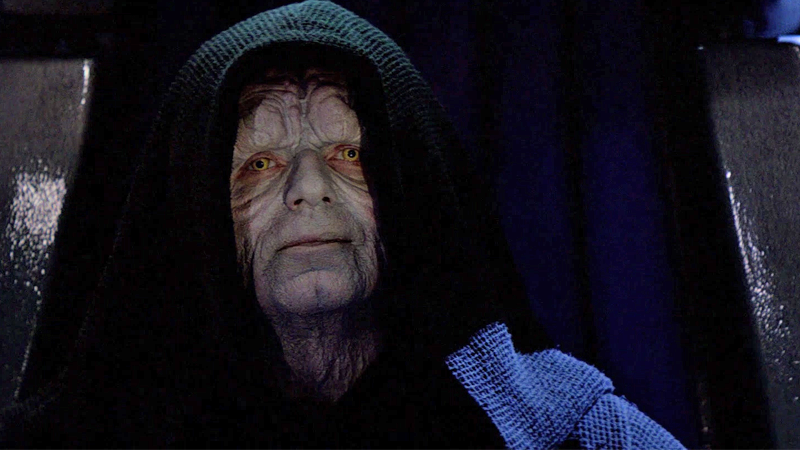 But the idea of a revived Palpatine been around for decades, in the context of the old Expanded Universe and in Lucasfilm’s plans for this sequel trilogy, stretching back to The Force Awakens’ development, something Lucasfilm president Kathleen Kennedy acknowledged to press in the wake of The Rise of Skywalker’s reveal this past Friday. And the Star Wars universe we have right now has been slowly but quietly laying the groundwork for the return of a villain that has stalked the Skywalker Saga from the very beginning. This is what Emperor Palpatine left behind—not just his plans and his hopes, but a Star Wars galaxy far more mystical and magical than we might have thought. One where the tragedy of Darth Plagueis the Wise might be less of a legend, and more of a reality. Originally planned to appear in early forms of The Force Awakens, the ruins of the Death Star II—also partially sunk under oceans, as they appear to be in The Rise of Skywalker—would’ve been home to the sunken remnants of the Emperor’s tower, and within it the mystical map to Luke Skywalker that both the Resistance and First Order were chasing. It won’t be now, of course, but it establishes that Palpatine’s bases of operation were hiding artifacts and keys to places strong in the Force—an idea we’ll see has been picked up elsewhere in tie-in fiction. Palpatine posthumously delivers orders to activate Operation Cinder via Sentinel Droid in Battlefront II. First introduced in the Marvel Comics miniseries Shattered Empire and then expounded upon in the story campaign for Battlefront II, if Palpatine’s other machinations were about rebirth, Project Cinder was very much about destruction. Implemented as what initially seemed like a posthumous “screw you” to the Rebellion that upended him, Project Cinder was a plan delivered to high ranking Imperial admirals to activate satellites above key worlds in the Empire that would agitate the environments of those worlds to such an extreme degree that all life on them would be wiped out, Imperial and Rebel alike. Another idea expounded upon in Battlefront II, having appeared elsewhere in tie-ins like the Aftermath trilogy of novels, is that Palpatine housed dozens of collections of relics strong in the Force in mysterious Observatories across the galaxy far, far away. They were connected to his research into the true source of the Dark Side’s power out in the beyond, and we know primarily of two already. Battlefront II introduced us to the Pillio Observatory, where Luke Skywalker found the compass that guided him to the first Jedi Temple on Ahch-To—and a reminder that Palpatine was interested in the Force across all of its spectrums, light and dark. In the years following the Emperor’s death, the Empire’s number of capital ships dwindled rapidly—the remnant went down from 13 Super Star Destroyers at the Empire’s height to just a single, the Ravager. But the most important of all, the Eclipse, wasn’t actually destroyed as had been assumed by what was left of the Empire. How does a Super Star Destroyer go missing though? By not really going missing. Because the Eclipse, Palpatine’s flagship, was deliberately given a mission that would outlast its master. In Life Dept and Empire’s End, we learn Palpatine had spent years calculating coordinates that ultimately lead out into the Unknown Regions—tasking the Eclipse with traveling out there to uncover whatever Palpatine saw as this nexus of Force power. The Eclipse made it out there, but Palpatine didn’t, and it served as the base of origins for remaining elements of the Empire after the Battle of Jakku to re-establish themselves as the First Order. Given his propensity to do so elsewhere, it’s safe to assume that the Eclipse didn’t just hold military might to traffic into the Unknown Regions, but more artifacts of Force power, intended for Palpatine and his new Empire to capitalize on once it reached its destination. Everything we’ve covered so far has been, despite being awash with the mystique of the Force, material—objects, artifacts, raw material, manpower, all the elements to rebuild an Empire. But how can that help rebuild a single man? We don’t know the extent of the power of the relics in Palpatine’s vast collection of Force-sensitive items, but the Star Wars Rebels TV series introduced us to a wild concept that could perhaps more directly connect to Palpatine’s resurrection, or rather technically, his return: Force-assisted time travel. Uncovered by the Empire on Palpatine’s behalf in the depths of the Jedi Temple on Lothal during Rebels’ final season, the World Between Worlds exists out of time and space in the galaxy far, far away, a nexus point of all moments that can’t just be witnessed, but accessed—and with enough strength in the Force, manipulated to save people from seemingly certain fate. Rebels also expounded the idea that in order to access the World Between Worlds, users had to be pure in how they wielded the Force—Palpatine tried, but couldn’t reach out in the way Ezra ultimately did to navigate it. Which is why he attempted to work through Ezra to access it, and why Ezra ultimately chooses to destroy the portal on Lothal. The final arc of Charles Soule and Giuseppe Camuncoli’s Darth Vader comic series delved into the creation of Darth Vader’s infamous castle, first glimpsed in Rogue One (but with a history that reaches far further back than that). 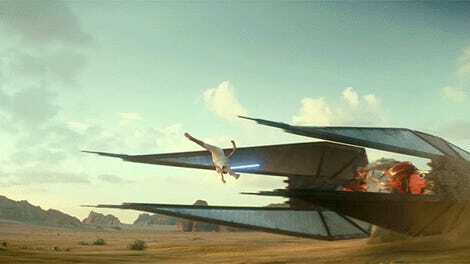 Built on a focal point of Dark Side energy on Mustafar by Vader with the help of the Force spirit of an ancient Sith named Momin—who had died untold years before the events of the Star Wars movies—the castle was designed in such a manner to specifically channel all that power into finding a way to resurrect Padmé Amidala. Vader didn’t succeed in that regard at least, but most importantly here, the forces he and Momin tapped into worked. Momin betrayed Vader and managed to pull himself out from a time before his death centuries beforehand and into the present, even if Vader almost immediately killed the “revived” Sith and attempted to access whatever plane they had opened himself. But it confirms at least one thing: the World Between Worlds, or something like it, exists in a way that acolytes of the Dark Side can access it, and exists in more than one place in the galaxy. If Palpatine ultimately found a place to do so—or perhaps even the source of power he sent the Eclipse to track was another way to access the World Between Worlds—and use time itself to dance around his death, it might be the answer to his return. The last time the Star Wars universe revived Palpatine in Dark Empire, it did so through science—specifically, cloning, something that would become oddly prescient to the movie saga. But from what little we can figure of this latest attempt already (if it does indeed involve bringing Palpatine back as physical, returned person rather than merely the kind of Force spirit we’ve only seen manifested by light-side practitioners in the movies so far), Star Wars is perhaps laying the ground for a return much more mystical and magical. One with an understanding of the Force as an entity more powerful—and much weirder—than we could have possibly imagined it being, in the hands of Jedi and Sith alike. We’ll no doubt find out more as we get closer to December 20, when Star Wars: The Rise of Skywalker hits theaters to bring this nine-movie journey to a close.